Bill Starr explains how to sensibly integrate limit lifts into a strength program. There are definitely two schools of thought in terms of doing singles in a strength routine. Some coaches believe athletes shouldn’t do them at all because they pose a much higher risk of injury than higher reps.
I’m very much in favor of utilizing singles in any strength program, and this includes programs for females and young athletes. Older athletes would, for the most part, be better off avoiding singles, with the exceptions being those who are still competing in Olympic and power meets. However, there are a few exercises where it’s smarter to stick with higher reps regardless of age and reason for lifting weights. Those exercises are primarily the ones that hit the lower back specifically: good mornings and straight-legged deadlifts. Ditto for back hyperextensions and reverse back hypers. The reason being that one false move or attempting a poundage you’re not quite ready for can result in an injury, and any sort of harm done to the lower back can be extremely painful and troublesome to rehabilitate. But apart from those exercises specifically for the lumbars, everything else is game, even movements for the smaller groups like the calves and biceps. Bill Starr recommends a host of exercises to build a strong upper back and neck. Bill Starr explains how to create a strong, balanced upper body. Bill Starr explains a simple way to plan a week’s worth of lifting for maximum gains. I really enjoy all of your articles, I have a question regarding 5s and 3s, when performing these say for the deadlift for instance, it it okay to pause between each rep and regrip and make sure your form is correct before makeing the lift, or should every rep in the set of 5 or 3 be done instantaniously one after the other? As an older athlete (51) and relatively new to Crossfit (1.5 years)and strength training in general, why should I be better off avoiding singles? for theses recommendations are these sets across or build ups? I have always liked Bill's articles. As should be obvious for a Westside devotee I disagree with the idea that less experienced lifters should not regularly incorporate singles. He also has some misinformation in the article relative to attachments (tendons and ligaments) and their role is absolute strength. He is right that limit lifting heavily taxes them, but his implication that less experienced trainees miss singles because of connective tissue issues is just plain wrong. If you miss a lift because of connective tissue you probably tore said tissue. Connective tissue is by definition non-contractile, it transfers force as opposed to creating it. Less experienced trainees, especially those without limit lifting experience miss heavy singles due to technique and or non-optimized neuralpathways for the given lift. Technique is HUGE for newbies and singles especially when it comes to short or long term injury prevention. 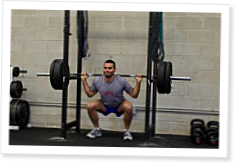 Sloppy technique on the bench, squat, and dead are a recipe for disaster. Being Non-contractile does not exclude a tissue from protective feedback loops. Golgi tendon organ, found in tendons, comes to mind. True, but autogenic inhibition is poorly understood and no longer considered to be the protective mechanism you are referring to. With that said, to postulate that the tendon structures are so weak in the untrained as to be significantly outstripped by the skeletal muscle's ability to produce force(in the same untrained) and therefore to somehow provide an inhibitory effect when attempting heavy singles is folly in my opinion. I would say it is the other way around. Tendon relative weakness usually only becomes problematic, assuming we define tears as problematic, in the more advanced resistance trained individual. The idea you need to strengthen your tendons (in healthy individuals) before attempting heavy singles assuming good technique is erroneous. Tendons adapt to training just as muscles do, albeit the muscles have a greater overall capacity for adaptation. The GTO was once thought to be quiet up to a high tension threshold at and beyond which it would fire and inhibit the agonist muscle. You are correct that this has been discredited. It does not mean that GTO doesn't play a crucial role. The reality is that the GTO is a key player in muscular control over a continuum of tissue tension providing a counterpoint to the muscle spindle. The interplay between these too sensory elements is essential for proper movement. To illustrate what I mean, I think if I offered to ablate the GTOs of your gluts, quads, and hams before your next powerlifting meet, you'd rightly decline. If you agreed to it, I'd bet you'd have a really bad meet and probably injure yourself. I'm not disagreeing with your opinion on singles, just giving the non-contractile tissue their due. The GTOs are there for a reason and the signals they provide are an integral part of the whole afferent picture coming into the brain. Also, tendon is MUCH slower to adapt than muscle. That being said, I'm sure it is rare in young, novice lifters that muscle adaptation out-paces tendon adaptation to the point of impending tendon rupture. I've only seen this as a concern in the context of anabolic steroid use.